Although we won’t be having our Christmas Dinner at our house this year, I decided to make a centrepiece for our kitchen table for the Festive period. It was very simple to make and inexpensive too. 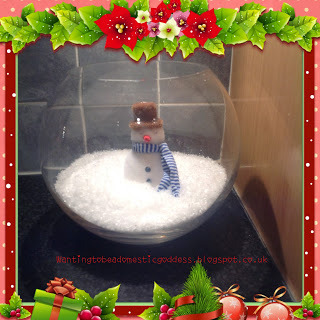 I already had the globe vase (was bought from Home Bargains two months ago for £2.95), so I bought 2 packs of Glitter Snow from Poundland and a Snowman decoration from Marks & Spencer (£4). 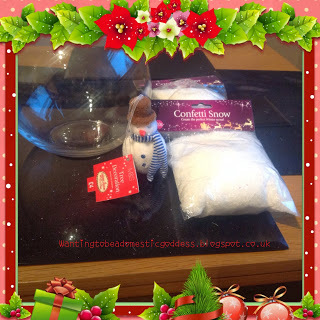 I filled the bowl a third of the way up with the fake snow (I only used one of the bags) and I cut the hanging ribbon off the Snowman and placed him into the snow and voila…………a Snowman table centrepiece! I did think of making a couple of Fimo Christmas Trees to put in alongside him but I really don’t have the time, so I may do that next year :)! I think that it looks very cute and it required minimal effort to make. Do you make your own Christmas Centrepieces or do you buy yours? I’d love to hear what you do! "Shoebox Appeal – Aberdeen Cyrenians"
I love it. Such a fab and cute idea. I might make one myself. That is so cute! I can't wait to see your Santa Claus decoration you mentioned in comment above! I found some time to make a few crocheting items I plan on posting next week!